Reading Yasmin Khan’s The Saffron Tales is like tucking into an expansive meal. As you turn the pages with luscious photographs and read the lovingly documented recipes and stories, you are enveloped in a sensual world of delicate aromas, myriad textures, and subtle flavours. Khan’s book is a celebration of harvests, traditions, and stories. She writes about the delicacy of the saffron harvest, traces the history of some of the celebrated Iranian produce such as pomegranate, and delves into their contemporary use, while taking the reader through the many different sofrehs (the patterned tablecloth on which dishes are served) of Iran. The Saffron Tales coaxes you to step into the kitchen and try many of the recipes out. And it’s not difficult, and that’s mainly because when you rummage through Khan’s extensive ingredients list, you realise that most of these are easily available in our kitchens. Iran was at the heart of the old Silk Route, and its location enriched its cuisine, making it, Khan says, “a poetic balance of subtle flavours such as dried limes, saffron and orange blossom”. In India Food & Cooking: The Ultimate Book on Indian Cuisine, Pat Chapman talks about how Iran’s monarchs Cyrus, who invaded northwest India in 532 BC, and Darius, his successor, introduced the region to Iran’s “indigenous ingredients such as spinach, pistachio, almond, pomegranate, saffron, and rose water”. Chapman further writes, “Rice was not indigenous and probably arrived there by trade after the Aryans first encountered Dravidian cultivation terraces. But it soon became the Iranian staple”. Later, the Mughals and the Parsis enriched and cemented the culinary synthesis. In her book, The Penguin Food Guide to India, Charmaine O’ Brien talks about the influence of Persian cuisine during the Delhi Sultanate rule. “The hallmarks of medieval Persian cuisine were dishes of meat cooked with rice; meat cooked with fruit; and a generous use of nuts, dried fruit and distilled flower essences such as rose water to flavour both sweet and savoury dishes.” From the biryani to naans and kebabs, so many of our foods trace their origin to Persia. For instance, Michael Krondl writes in The Donut: History, Recipes, and Lore from Boston to Berlin about how Persian invaders brought with them a “round fritter that eventually became gulab jamun. 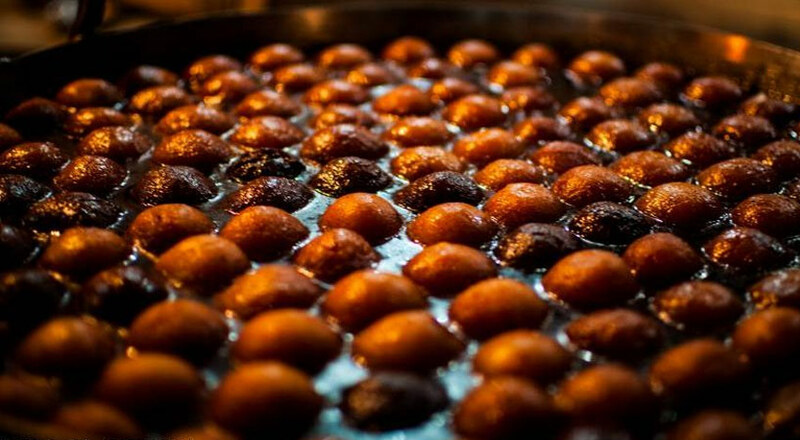 (gulab comes from the Persian word for rose water, while jamun refers to a local fruit of roughly this size. )” He adds, “The [Indian] recipe is more complex than in the Middle East, requiring a mixture of dried and fresh milk thickened with flour. 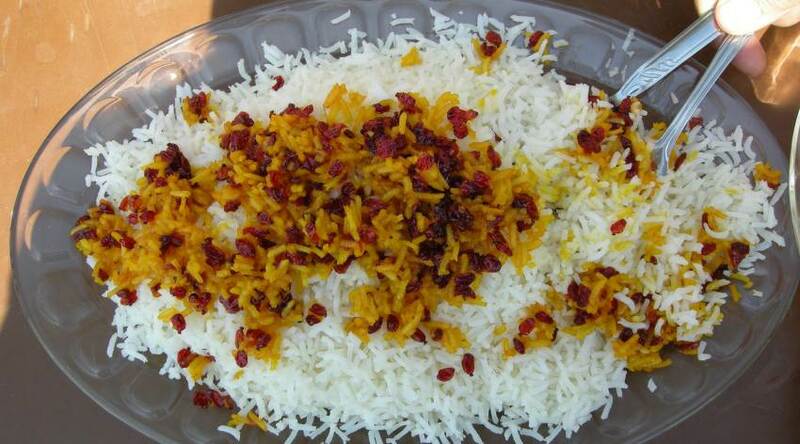 But as in Iran, the mixture is fried and soaked in rosewater syrup”. Most commercial gulab jamuns now come without the rose water, but it still conjures up the beauty of rose petals being distilled into a fragrant essence. At the beginning of her book, Khan writes, “Those unfamiliar with the food often come to the sofreh… expecting spicy, fiery flavours, perhaps more befitting the country’s climate and politics, and are often surprised to find that the cuisine is gentle and soothing…” Not unlike our country, where different regions have a different staple, produce, and recipes. Khan explains “slow-cooked stews known as khoresht and elaborate rice dishes layered with herbs, vegetables, legumes, meat, nuts and fruit are the bedrocks of Persian cuisine, creating a dazzling mosaic of scents, textures and colours…” The khoresht is cooked depending on the region and the seasonal produce, but each has a distinct sour and sweet taste balance. In India too, spice doesn’t dominate the palate, rather it’s about striking that perfect balance. Persian cooking, of course, uses more herbs, than spices. Flavours stand out like in the Chelow, a classic Persian dish, which is perfectly cooked rice with a “buttery saffron crust”. Or, the Bagalee ghatogh, where fresh beans are cooked with turmeric, garlic, and dill. Even the gheimeh, slow-cooked lamb shoulder with dried lime split peas, doesn’t have a lengthy list of ingredients, but promises a unique citrusy flavour with the addition of dried limes. Seasonal produce and ingredients sparkle in The Saffron Tales. For instance, Khan writes about Rasht, the capital of the Gilan province in northern Iran, where fresh young garlic is often eaten raw at the dinner table. Similar to what Gujaratis do in the winter months, the only difference being they sauté it in ghee before serving. Many of the recipes are familiar – burnt aubergine dips (think baingan bharta), yoghurts flavoured with vegetables and herbs (raitas), and naan (well, naan). Like many Indian recipes, Iranian cooking constitutes of approximate measurements of ingredients, easily substituted with another based on availability, and mostly by following the smell and taste of food as it gets prepared. Fresh fruit, salads, and yoghurt are ubiquitous. Like most of our meals, Persian meals are not complete without the salad, “adding a welcome crunch and freshness to complement the hearty stews and gentle rice dishes”. Salad Shirazi, for instance, is a simple mix of cucumbers, tomatoes, red onion, and radishes tossed together with dried mint, olive oil, lemon juice, sea salt, and black pepper. Quite like the Maharashtrian kachumber of onion, tomatoes, green chillies, and coriander tossed with nimbu, salt, and pepper. But the dried mint is a fabulous addition. Khan points out that sharing food is central to the Iranian approach to eating. “An Iranian would never simply reach into the fruit bowl and take a bite of an apple; instead they would cut the apple into slices and offer it around the whole group, even if that meant there was only one slice left for them at the end”. In her introduction, she writes about how usual it is for food to be offered to strangers in bus or plane journeys. And that reminds me of the great Indian train journeys, where dabbas of food are generously shared with co-passengers. 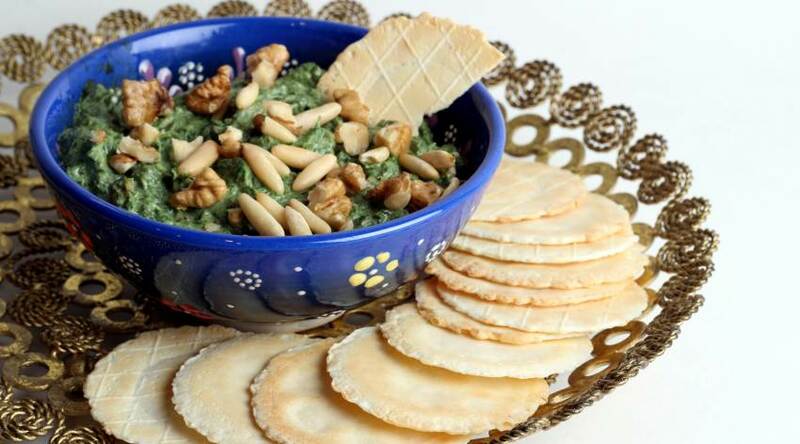 Traditionally, writes Khan, “Persian food doesn’t separate starters from main courses. Instead, the table or sofreh is dotted with small plates of vegetables, yoghurt, olives, pickles and salads that are eaten alongside the rice dishes, stews and kebabs”. Much like our thalis and thaals, where everything is served together. In the way that Indians coax the natural sweetness out of vegetables, Khan’s recipes do the same. One such recipe is the morab-ye kadoo halvaa-ee, a spiced butternut squash preserve. Unlike our mango morabba which is more gelatinous in texture, this one is a sweetened pumpkin puree which works beautifully with morning granola and cheese cake toppings. Her carrot, cardamom and rosewater jam with a dash of orange zest will most probably elevate the humble bread and butter as a breakfast option. Fruits, conversely, are used to flavour savoury dishes. There’s a river fish that is stuffed with walnuts, basil, and pomegranate molasses and baked. Plums and apricots are salted and dried added to stews and soups.